The Muratorian fragment, also known as the Muratorian canon, is a copy of perhaps the oldest known list of the books of the New Testament. One of the most important documents to scholars interested in reconstructing the development of the New Testament canon, the Muratorian fragment lists and describes most, but not all, of the current New Testament scriptures. It thus helps humans understand the process by which early Christians decided which books they would include or omit from the collection of texts accepted as holy scripture. The author notably omits the Epistle to the Hebrews, the Epistle of James, and the letters of Peter, but he mentions favorably the Wisdom of Solomon, the Shepherd of Hermas, and the Apocalypse of Peter, which were omitted by the later church. He specifically rejects works by Marcion and gnostic teachers such as Valentinius and Basilides. The document is a seventh or eighth century Latin manuscript that came from the library of Columban's monastery at Bobbio, northern Italy. It contains internal cues which suggest that the original was written about 170 C.E., probably in Greek, although some regard it as later. 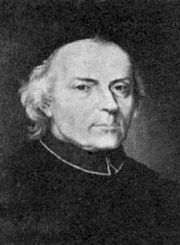 The fragment, from which the beginning is missing and which ends abruptly, was discovered Father Ludovico Antonio Muratori (1672–1750), the pre-eminent Italian historian of his generation, and published in 1740. The Muratorian fragment is of great importance for the history of the Biblical canon. Written in or near Rome in the late second century C.E., the document is not a simple list of scriptures, but of a survey that supplies historical and other information regarding each book. The Bamberg Apocalypse text of the Book of Revelation. The Muratorian fragment accepts the Book of Revelation along with the Apocalypse of Peter, and the Shepherd of Hermas, which were ultimately omitted from the New Testament. The beginning of the text is missing, and the existing document begins in the midst of its description of the Gospel of Mark, moving from there to the Gospels of Luke and John. It may be presumed that the writer included the Matthew in the missing section at the beginning. The author spends some energy justifying John's unique view compared to the synoptic Gospels, emphasizing that he was both an eye-witness and a hearer of Christ, and relating that this Gospel was written by John in conjunction with other disciples as they recalled various events from the life of Jesus. He affirms the Acts of the Apostles as the work of Luke, stressing the fact that Luke, though he did not know Jesus in the flesh, was an associate of Paul who included eye-witness descriptions of events. Saint Paul's epistles (including those to Philemon, Titus, and Timothy) are also mentioned. The author sees a special significance in the fact that Paul wrote letters to seven churches, as did the writer of the Book of Revelation. The author rejects Paul's supposed letters to the Laodiceans and Alexandrians, as did later church tradition, specifying that these were "forged" in order to combat the heresy of Marcion. The Epistle of Jude and two of the three epistles of John are included, although the author is not certain if those of John are truly written by the apostle. Neither the epistles of Peter or Epistle of James is mentioned, and the Epistle to the Hebrews is also absent from the list. The author pointedly refers to certain letters in circulation which the church rejects, so as not to mix "gall with honey," but he does not specify these. He accepts, however, the apocryphal Wisdom of Solomon, which he holds to have been written by the ancient king and his associates. Turning to apocalyptic literature, the writer accepts the Book of Revelation, as well as the Apocalypse of Peter (later excluded from the New Testament), noting, however, that some authorities did not allow Peter's apocalypse to be read in church. He also accepts the Shepherd of Hermas, another apocalypse that was ultimately omitted in the final collection of New Testament texts. He notes however, the Shepherd, while generally acceptable, is not to be read at formal church services. Besides the letters forged in Paul's name, the author rejects a number of scriptures on the grounds that they were used by heretics. He specifies that the writings of the gnostic teachers Valentinus, Basilides, and Miltiades are to be rejected, as is a certain new "Book of Psalms" used by Marcion. The original text of the Muratorian fragment is normally dated to about 170 C.E. or slightly later, partly on the grounds that its author refers to Pius I, bishop of Rome (142-157), as recently living. Some scholars, however, have also dated it as late as the fourth century. The Latin copy of the text is thought to have been made in the seventh or eighth century. The Latin of the surviving copy is considered very poor, and there is disagreement among scholars as to the correct meaning of some of the sentences. A number of authors have been suggested as composing the original Greek work, including Papias, Hegesippus, Caius of Rome, Hippolytus of Rome, and Melito of Sardis. Codex Alexandrinus version of the Gospel of John, which the Muratorian fragment describes as a collaborative effort involving John, Andrew, and other disciples as they later recalled events. The third book of the Gospel, that according to Luke, the well-known physician Luke wrote in his own name in order after the ascension of Christ, and when Paul had associated him with himself as one studious of right. Nor did he himself see the Lord in the flesh. And he, according as he was able to accomplish it, began his narrative with the nativity of John (the Baptist). The fourth Gospel is that of John, one of the disciples. When his fellow-disciples and bishops entreated him, he said, “Fast ye now with me for the space of three days, and let us recount to each other whatever may be revealed to each of us.” On the same night it was revealed to Andrew, one of the apostles, that John should narrate all things in his own name as they called them to mind. And hence, although different points are taught us in the several books of the Gospels, there is no difference as regards the faith of believers, inasmuch as in all of them all things are related under one imperial Spirit, which concern the Lord’s nativity, His passion, His resurrection, His conversation with His disciples, and His twofold advent—the first in the humiliation of rejection, which is now past, and the second in the glory of royal power, which is yet in the future. What marvel is it, then, that John brings forward these several things so constantly in his epistles also, saying in his own person, “What we have seen with our eyes, and heard with our ears, and our hands have handled, that have we written.” For thus he professes himself to be not only the eye-witness, but also the hearer; and besides that, the historian of all the wondrous facts concerning the Lord in their order. Moreover, the Acts of all the Apostles are comprised by Luke in one book, and addressed to the most excellent Theophilus, because these different events took place when he was present himself. And he shows this clearly—that is, that the principle on which he wrote was to give only what fell under his own notice—by (his) omission of the passion (death) of Peter, and also of the journey of Paul when he went from the city—Rome—to Spain. The author accepted the letters of Saint Paul as canonical, but specified that those supposed written to the Laodiceans and Alexandrians were forgeries. As to the epistles of Paul, again, to those who will understand the matter, they indicate of themselves what they are, and from what place or with what object they were directed. 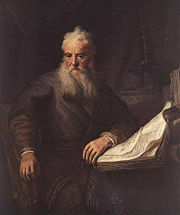 He wrote first of all, and at considerable length, to the Corinthians, to check the schism of heresy; and then to the Galatians, to forbid circumcision; and then to the Romans on the rule of the Old Testament scriptures, and also to show them that Christ is the first object in these—which it is needful for us to discuss severally, as the blessed Apostle Paul, following the rule of his predecessor John, writes to no more than seven churches by name, in this order: The first to the Corinthians, the second to the Ephesians, the third to the Philippians, the fourth to the Colossians, the fifth to the Galatians, the sixth to the Thessalonians, the seventh to the Romans. Moreover, though he writes twice to the Corinthians and Thessalonians for their correction, it is yet shown—that is, by this sevenfold writing—that there is one Church spread abroad through the whole world. And John too, indeed, in the Apocalypse, although he writes only to seven churches, yet addresses all. He (Paul) wrote, besides these, one to Philemon, and one to Titus, and two to Timothy, in simple personal affection and love indeed. Yet these are hallowed in the esteem of the Catholic Church, and in the regulation of ecclesiastical discipline. There are also in circulation one to the Laodiceans, and another to the Alexandrians, forged under the name of Paul, and addressed against the heresy of Marcion; and there are also several others which cannot be received into the Catholic Church, for it is not suitable for gall to be mingled with honey. The Epistle of Jude, indeed, and two belonging to the above-named John—or bearing the name of John—are reckoned among the Catholic epistles. And the Book of Wisdom, written by the friends of Solomon in his honor, bringing into the world the Apocalypse of John and that of Peter, though they are not read in some churches. The Shepherd of Hermas, moreover, did Hermas write very recently in our times in the city of Rome, while his brother bishop Pius sat in the chair of the Church of Rome. And therefore it also ought to be read; but it cannot be made public in the church to the people, nor placed among the prophets, as their number is complete, nor among the apostles to the end of time. Of the writings of Arsinous, called also Valentinus, or of Miltiades, people receive nothing at all. Those are rejected too who wrote the new Book of Psalms for Marcion, together with Basilides and the founder of the Asian Cataphrygians. Hahneman, Geoffrey Mark. The Muratorian Fragment and the Development of the Canon. Oxford theological monographs. Oxford: Clarendon Press, 1992. ISBN 9780198263418. McDonald, Lee Martin, and James A. Sanders. The Canon Debate. Peabody, Mass: Hendrickson Publishers, 2002. ISBN 9781565635173. Metzger, Bruce Manning. The Canon of the New Testament: Its Origin, Development, and Significance. Oxford: Clarendon Press, 1987. ISBN 0198269544. Roberts, Alexander, James Donaldson, A. Cleveland Coxe, Allan Menzies, Ernest Cushing Richardson, and Bernhard Pick. The Ante-Nicene Fathers. Translations of the Writings of the Fathers Down to A.D. 325. Buffalo: Christian literature Pub. Co, 1885. OCLC 445225. All links retrieved October 31, 2018. This page was last modified on 31 October 2018, at 15:30.